A video that will not take you too long to figure out the importance of having the right support for you as well as your children’s dreams. This is probably not the first time we have seen such a script, but stories like this tend to warm the heart and deliver the message effectively. It resonates with many and gives you that tint of light, enough to drive you forward and accomplish that one wish you had. Simple, inspiring and lovely. It is unlikely you would walk away unfazed after watching this video. Projection mapping on cars, buildings and surfaces had been widely adopted. However, projection recognition is something rather peculiar. Imagine the computer identifying your facial features, blends it nicely with the light, completely transforming your face into another shell for content projections. A real life CGI projection that traces and follows the movement of the surface it projects. This is absolutely mind-blowing. Check out Prosthetic Knowledge. Here’s a relatively interesting use of Pinterest. I have had the opportunity to work with a client on a past project where we created a huge image that was right smack onto the Pinterest gallery, allowing us to actually dissect the grid into different pictures. There are numerous ways to leverage on the grid system of Pinterest. Of course, ideally you would like to first do your research to understand the different offerings from each social app out there in the market before making a decision for a go ahead. What you see here is some really creative approach by advertising agency, Dare, from Vancouver. They pretty much make good use of the grid system of Pinterest to create a 25 days calendar out of it. Atop of that, each box is a video linked from Vimeo when you click it. Not only does it has a story behind it, there is content behind the entire work. Good use of media and great content engagement there guys. We see creative work being done all over the world each day with more and more zany ideas coupled with great innovations and technology. How about some really cool outdoor action purely based on an activation stunt? 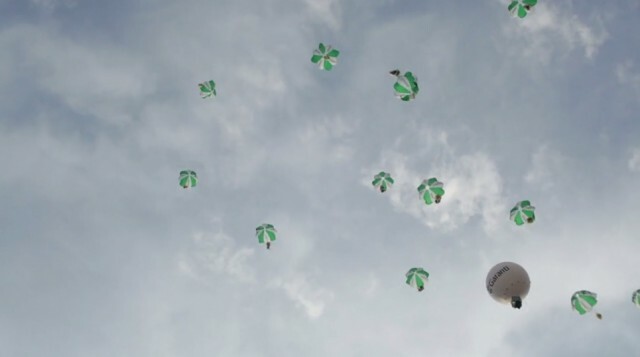 The Bank of Garanti in Turkey has just displayed their take for great creative work with this amazing outdoor stunt. They got a really cool events company, Ikarus Events to launch this campaign. What they did was to eventually fly a solo glider up and rain mini packages of soft cute toys across the city. Daring approach I must say. As much as I can see how the outcome would be, I personally love the way they push the message across. It almost seem like an air ambush but done in the name of fun! As you look up in puzzlement and wonder hard, you then slowly make up of what it is and instantly people rushed towards the free stuffed animals. As the adage goes, seeing is believing.